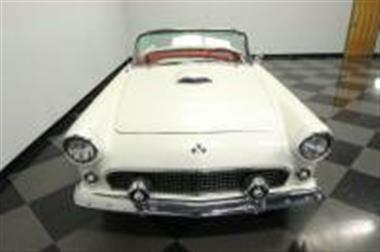 1955 Ford Thunderbird in Lutz, FL for sale. Price Analysis: Good Deal, 23.0 % below market avg. What's this? Youre looking at a 1955 Ford Thunderbird that takes all the great lines of this icons first yearand#44; and then adds a few subtle upgrades to ensure it remains unique. 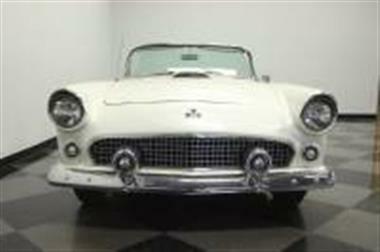 Best of alland#44; this total package is available at one of the most affordable prices youll ever see for a 55 T-bird. 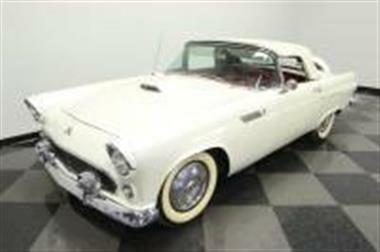 <p><br><br> A white Thunderbird can almost make you feel like American royalty. In factand#44; this one was changed from Snowshoe White to Pearl White just to have that extra hint of sparkle. And you see more of these small upgrades that make a big difference. Its in everything from the extra tall whitewall tires to the rear bumper borrowed from the 1956 cars (it allows for the Continental kit and the exclusive bumper side/corner exhaust.) 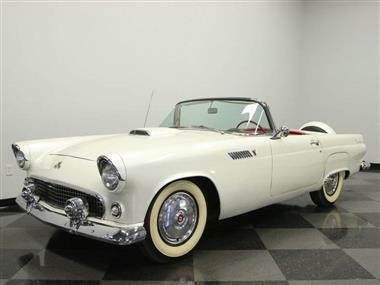 The reason why these features work so well is because they coordinate with the other iconic touches of this T-bird like the side skirtsand#44; jet-inspired taillightsand#44; factory wheel coversand#44; and chrome front bumpers with their bullet-nose ornamentation. <br /> <br><br> Red interiors always look fantastic on white cars. 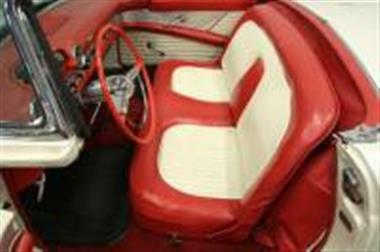 Thoughtful luxury was a true hallmark of this classicand#44; and thats why the white tuck-n-roll seat inserts in the seats will make the interior and exterior looks seamless when you drive with the white folding top down. Theres even an upgrade to an AM/FM/cassette stereo w/digital tuner so you can listen to much more modern tunes in this very vintage ride. 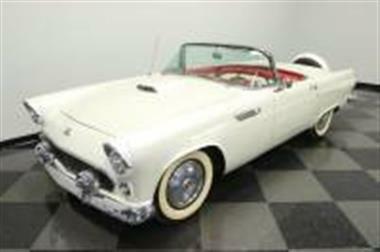 But besides great accommodationsand#44; this Thunderbird does have a bit of an aggressive side. The machine-turned panel that flows across both doors and the dash always looks performance-orientedand#44; but when its combined with the large cue ball shifterand#44; it feels downright speedy from behind the wheel. 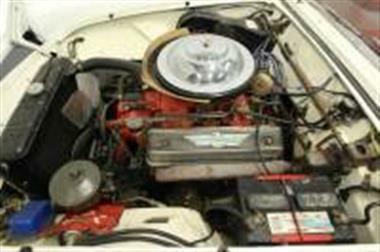 <br /> <br><br> Under the hood is the Thunderbird Special 292 cubic inch V8 which purrs sweetly through an authentic dual exhaust system. Bright red engine paint was a Thunderbird design statementand#44; along with the bright chrome air cleaner and gorgeous cast aluminum valve covers that were part of a dress-up kit. While you can get some serious power out of the V8and#44; especially with the control of the three-speed manual transmissionand#44; this easily settles into the nice and comfortable ride provided by Fords personal luxury convertible and the power steering.<br /> <br><br> Youre looking at an American icon that a bit more unique and sporty than the others you see out there. And best of all this distinction is surprisingly affordable. Call today!!! 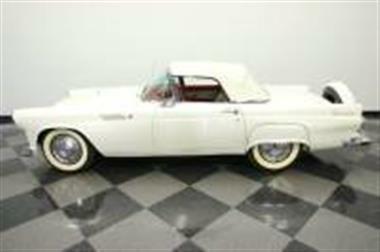 This vehicle is priced $8,982 less than the Average Market Price of $38,977 for a 1955 Ford Thunderbird. This is a Good Deal as it's priced 23.0 % below market avg. The Pie chart below shows the number of ads within different price ranges.